Hydrogen-powered vehicles: demand exceeds supply. Cities across Europe need to improve the quality of their air – and fast. More and more city and regional authorities are turning to fuel cell technology, which offers an emission-free alternative for use in vehicle fleets, heat generation and industrial processes. Hydrogen is the fuel that powers the technology. A recent Roland Berger study found that some 90 European cities are investing close to EUR 1.8 billion in this future technology over the coming five years. The necessary infrastructure is already being put in place, but the car industry in particular is still lagging behind, not yet building hydrogen vehicles in sufficient numbers. “A lot of money has gone into battery technology in recent years – in Europe especially,” explained Yvonne Ruf, Partner at Roland Berger. “Fuel cells spent a long time in the shadows owing to a lack of demand, but now they are experiencing a renaissance of sorts” . 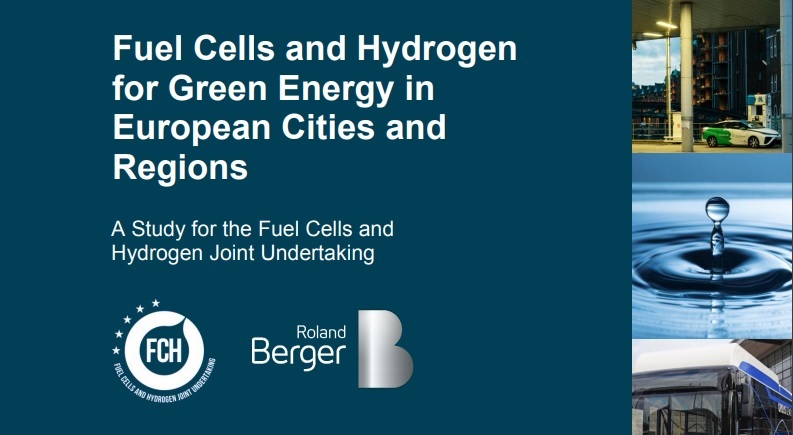 She is one of the authors of the study Fuel Cells and Hydrogen for Green Energy in European Cities and Regions, which Roland Berger conducted on behalf of The Fuel Cells and Hydrogen Joint Undertaking (FCH). Hydrogen-powered fuel cells are a key technology in the quest to cut the greenhouse gases that are so detrimental to our climate and our health. Having vehicles that run on the technology, especially in heavy-duty or fleet operations, can give providers an advantage because refueling is fast and hydrogen vehicles have a longer range than many alternatives. This fact was acknowledged by the 89 European cities and regions polled by Roland Berger, who said that they were planning to invest as much as EUR 1.8 billion over the next five years in hydrogen-powered public buses, cars and delivery vehicles as well as in electrolyzers to produce hydrogen and in combined heat and power generation plants. In the medium term they are also looking to spend money on hydrogen-powered garbage trucks, trains and boats. This conversion to hydrogen promises not only environmental benefits but also a boost to economies: The global Hydrogen Council even anticipates the creation of some 30 million extra jobs through 2050. The application of hydrogen technology will generate annual revenues in the order of USD 2,000 billion worldwide – assuming hydrogen takes off as an energy source globally and is able to serve up to 18 percent of the world’s energy needs. The recent study found that most of the cities and regions already have specific plans in place and have also agreed or at least applied for corresponding funding. Their plans even include establishing special refueling stations. Starting from the year 2022, the expectation is that the network will be built up quickly, with the necessary quantities of hydrogen mainly created locally by electrolysis. That said, the regions and cities polled in the study do face certain difficulties when it comes to putting their plans into practice. Because there are currently few – mainly Asian – OEMs offering hydrogen-powered buses, delivery vehicles and cars suitable for commercial operation, and they are only manufacturing in small quantities, demand exceeds supply. Some public invitations to tender have evidently been withdrawn already as a result. Given that additional demand for trucks and trains can soon be expected to come from private-sector logistics providers, the study authors are recommending that auto manufacturers substantially ramp up their production capacities – particularly the European OEMs, many of whom currently build to order or have long lead times. “Hydrogen fuel cells represent a competitive technology in the vehicle context, particularly for heavy-duty applications and in fleet operation. If a large-scale transition to emission-free vehicle fleets is to take place, OEMs must invest now to secure an important slice of the market,” said Heiko Ammermann, Senior Partner at Roland Berger and Head of the Transportation Competence Center.